No Postal Stamp For The "Inventor of Rosogolla"
Who is the 'Inventor of the Rosogolla'? If you answered, Nobin Chandra Das, then please note that it is not the correct answer. Following the Banglar Rasogolla GI tag, unfortunately many are misinformed owing to the bombardment of biased and misleading information via news-reports and videos shared by most media. 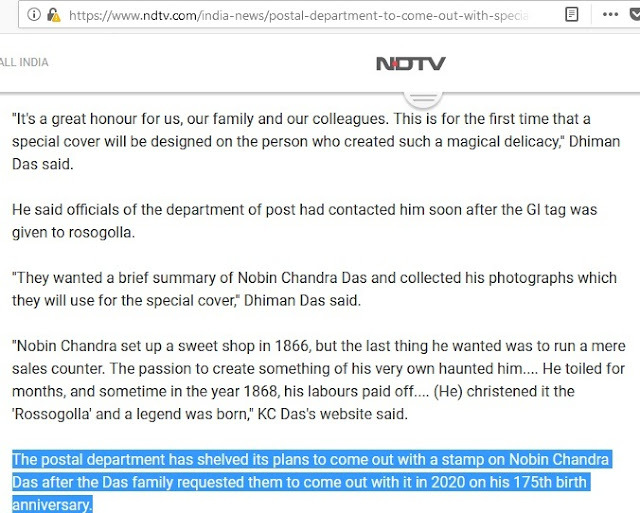 Articles claim that Nobin Chandra Das "invented the Rosogolla in 1868" and that 2018 is the 150th year of the "Invention of Rosogolla"! It may be mentioned that apart from the so-called "Invention of Rosogolla in Calcutta, Bengal, in 1868", there is no evidence in this regard except a stone plaque erected in 1968 in K.C.Das's family home in Baghbazar, Calcutta, to commemorate the "centenary celebration of Rosogolla invention". "The famous institution of the inventor of Rosogolla, Mr Nobin Chandra Das, was located here. The institution was shut down by the order of the government banning production of milk sweets in 1965. this stone inscription commemorates the centenary of the invention of Rosogolla: 1868-1968." But, despite these facts, many are still not aware or do not support/agree that Shri Nobin Das is not really the "Inventor of Rosogolla". Many incorrectly think that "Rosogolla" belongs to Bengal and originated in Bengal and that "Odisha lost & Bengal won" the "battle for Rosogolla". "Department of posts is all set to recognise West Bengal sweetmeat maker Nobin Chandra Das, who invented the rosogolla in 1868, with a stamp and a special cover after one of India’s most celebrated desserts was granted the geographical indication status." On probing with the postal authorities, we learned that West Bengal authorities had approached the Dept. of Posts & the latter had agreed to do so under the scheme- Corporate "My Stamp". As per this scheme, we learned that the interested party has to pay Rs 12 Lakhs to get a postal stamp in own name. I) Rasagola has existed for centuries in Odisha before it was "invented" in West Bengal in 1868. 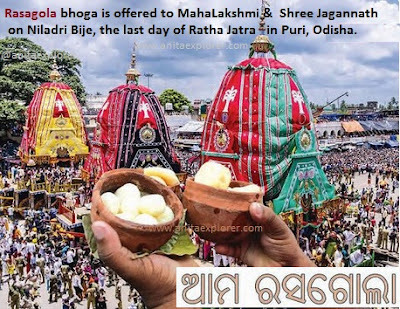 It has been offered as a bhoga to Shree Jagannatha & Mahalaxmi on Niladri Bije of Ratha Jatra. Rasagola is a Mahaprasad of Shree Jagannath, Puri, Odisha. 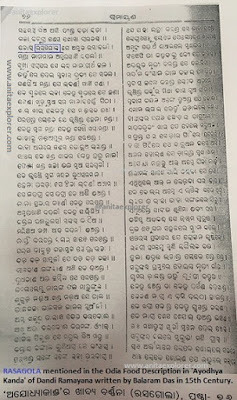 There are many documentary evidences including the Dandi Ramayana, written by Balaram Das in the 15th Century, that mention "Rasagola" in Odia language. II) Odisha has NOT submitted a GI application for Rasagola as yet. 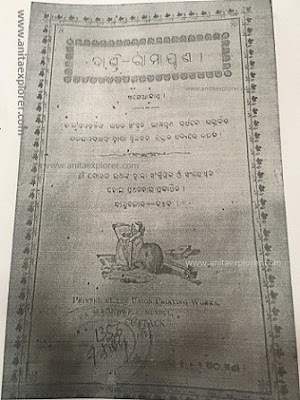 As Odisha possesses a prior historical & cultural GI association with Rasagola, it will be technically incorrect & grossly unfair to commemorate a stamp in the name of Shri Das as the "Inventor of Rosogolla". "Should a stamp be accessible to anyone who can pay the money? Can I print a stamp claiming ownership or having invented something that I really haven't? All I need is Rs 12 Lakhs- to print & to further reinforce something that is not true/right?" The said mail did a lot of travelling, making the rounds starting from Dak Bhawan, Delhi, via Bhubaneswar to Kolkata. 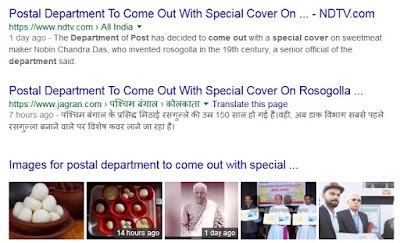 Just when we thought, they are seriously reconsidering their decision and will not come out with a stamp, the fresh news is: "Postal Department To Come Out With Special Cover On Rosogolla Inventor". Do read the inconsistency in the reports. Now that we have been informed about the "Special Cover On Rosogolla Inventor" by the Postal Department, the questions previously asked regarding the postal stamp and the basis of honouring the "Rosogolla Inventor", still hold true for the "special cover" too. "Should a special cover be accessible to anyone who can pay the money? Can I print a special cover claiming ownership or having invented something that I really haven't? All I need is Rs X Lakhs- to print & to further reinforce something that is not true/right?" We understand that upholding truth, justice & proper unbiased facts & correct communication is very important. We request the Postal Department and the Geographical Indications Registry to not be a party to misinformation. We do not support distorted and untrue historical representation. 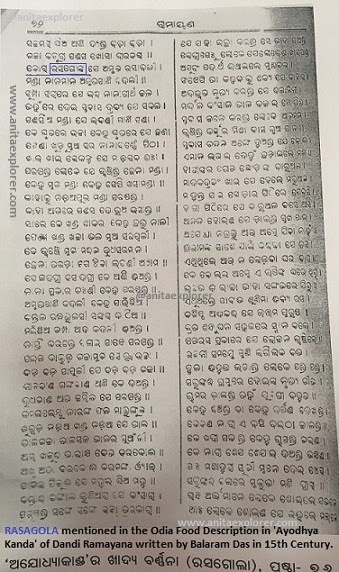 Please read eminent cultural researcher & Sahitya Akademi awardee, Shri Asit Mohanty's well-researched article on Rasagola to learn more. Do you agree that people should be able to pay money and get a postal stamp or special cover issued in their honour? Do share in the comments below. Superb article. We certainly don't want propagation of falsehoods any further. Let all know rasagola birthplace is Odisha and no one else can claim as their own. Thank you for writing this and letting ppl know. Sad that propaganda has succeeded in spreading misleading & wrong information. High time the world knows the reality about the origin of Rasagola. The real birthplace of the Rasagola, Odisha, must earn her deserving credit.